Minimum/Maximum Deposit Amount in Rs. No maturity period. Every year Interest will be paid as per their savings. ATM facility available. Can withdraw from bank ATM too. No service charge for PO ATM withdrawal. Free SMS service. Monthly Recurring Deposit. After 3 years Premature closure is allowed. Monthly interest can be withdrawn. 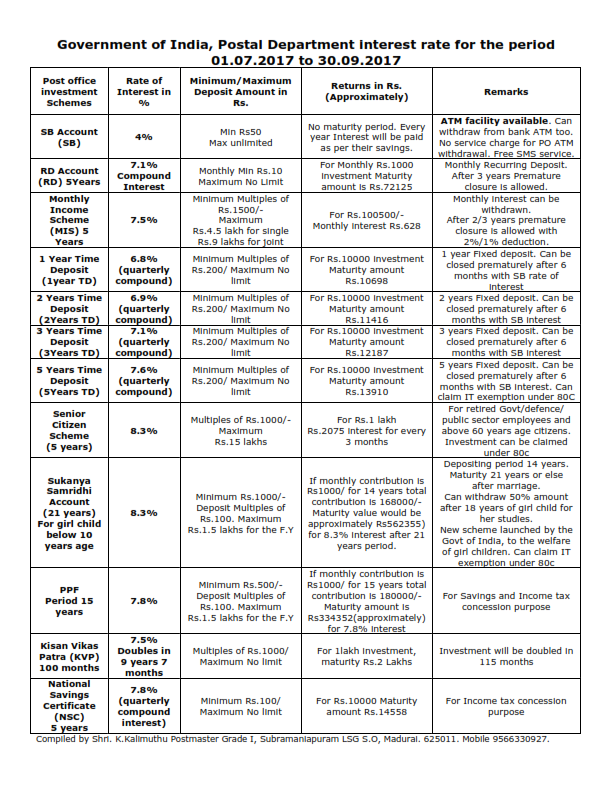 If monthly contribution is Rs1000/ for 14 years total contribution is 168000/- Maturity value would be approximately Rs562355) for 8.3% interest after 21 years period. Depositing period 14 years. Maturity 21 years or else after marriage. Can withdraw 50% amount after 18 years of girl child for her studies.